Khalid Abdalla stars in The Kite Runner, directed by Marc Forster, as Amir, a man who leaves California for Afghanistan, his homeland, to find the son of Hassan, his best friend from childhood, and to face his past. As children, Amir and Hassan enjoyed a happy friendship while flying kites until Hassan was raped by older bullies. Based on the novel by Khaled Hosseini. This is Khalid Abdalla's first major film role. He has previously had a small role as a terrorist in United 93. I had the privilege to interview him. 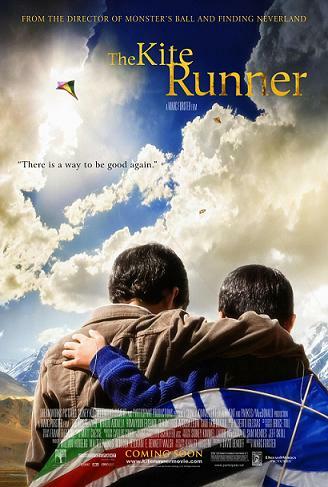 Paramount Vantage and Sidney Kimmel Entertainment release The Kite Runner on December 14th, 2007. NYC MOVIE GURU: How do you compare Egyptian culture to Afghan culture? KA: There is a great deal of similarities. Without my Egyptian background, there are a lot of things that I wouldn’t have been able to bring to the film. Take my Egyptian background in the place I grew up in, London, the bicultural experience is something that’s very important to the film and to [its] story. My understanding of that is very important to the film. Although Egypt and Afghanistan are different, one of the important things they have in common they both have a serving class. NYC MOVIE GURU: How did you learn the Dari language? KA: I didn’t speak Dari before I did this film. Had I not spoken Arabic, I don’t think I would have been able to pick it up in the time that I did it. I spent a month in Afghanistan before we started filming. Somehow, in the course of that month, on the count of immersion, I banished English and veraciously went at the language. I had 4-5 hours of Dari lessons a day as well as a huge amount of traveling, both within Kabul and outside. I went everywhere referenced in the book and ate everything I could find and went to weddings. Somehow, after that month, I was able to speak Dari, which has mercifully simple grammar. There’s no gender like in English, so you don’t have to agree the adjective and adverbs or to think of how you’re conjugating your verbs relative to gender. Because Dari shares 50% of its vocabulary with Arabic, I was able to bloom. NYC MOVIE GURU: In what ways do feel spiritually connected toward the story of The Kite Runner? KA: Although I’m not Afghan, I share in the fact that this is the first film in the history of Hollywood where the first point of contact with the whole region is a human, family story and not political violence. I share in my love for that and in my desire to give everything I can do it. That fits in to how and why I had to learn the language because I know what it feels like to be misrepresented. I know what it feels like to be treated as if the style of dress or the type of gun or the type of furniture is more important than how a whole culture in the region speaks and lives. My desire to be as accurate as possible comes from the experience of knowing what it feels like when that doesn’t happen. NYC MOVIE GURU: What is it like for you to watch the stoning scene? KA: It’s an awful scene to watch. I’m vociferously against capital punishment and stoning is the medieval way of sticking someone up and electrifying them. That’s just brutal and disgusting to me. Some of the greatest countries in the world still execute in the most barbaric ways. The issue really is, in terms of the scene, the reasons for the execution and, clearly, adultery isn’t one of them. NYC MOVIE GURU: How do you feel about Afghanistan now that you’ve been there? KA: I never like to get overly dour about Afghanistan because also what I saw was a country and a people with immense resilience, pride, love and thirst for life. Afghanistan went through thirty years of war, but also had thirty years of weddings through those years of war. [This] reaffirms my pride of being a human in all of its positive attributes. NYC MOVIE GURU: What important lessons did you learn in theater which you bring to your experiences of acting in a film? KA: I now have two homes: in theater and in film. Theater is where I started. It’s where I learned to be an actor and how you tell stories as an actor. Although theater and film are very different, what you’re trying to do, whether as a director or as an actor, is to find the best way to tell the story in that medium. In theater, you have to go through a four-week process of rehearsals, on average, to get to point where you can create something that’s free-standing and you can from the beginning through the end with no stops, knowing exactly what you’re doing, where you’re going, and what the off-shoot of the is. You have to create your own editing process in the rehearsal room. In film, you don’t. You work on each scene and the rhythm is created visually and created in the editing room. So, that changes your responsibilities as an actor to a certain extent. Also, you have different tools—you can never have a close-up on stage. At the end of the day, [though], it’s the similarities that are greater. Shooting a scene is a lot like rehearsing a scene. NYC MOVIE GURU: What’s stopping you from choosing a more lighthearted, comedic role? KA: I don’t know what’s stopping me. I guess there’s a tragic sensibility somewhere in me. Great tragedy always has lightness to it—it has to. People cry watching The Kite Runner, but I think there’s something uplifting about it.